Bengalis are fond of fish as they are of sweet. There are more sweet shops in Bengal than there are grocery stores. Bengali rasogollas and sandesh has become a pride and heritage for all Bengalis. But, these are what we get in the sweet shops and are generally not prepared at home. Payesh or rice pudding is one of the most common desserts that you’ll see getting prepared in every Bengali household. It is one of the most authentic Bengali desserts. Payesh is offered as bhog during pujas, and also as a sweet treat for every birthday. Payesh has a special place in the menu to bid farewell to your loved ones. 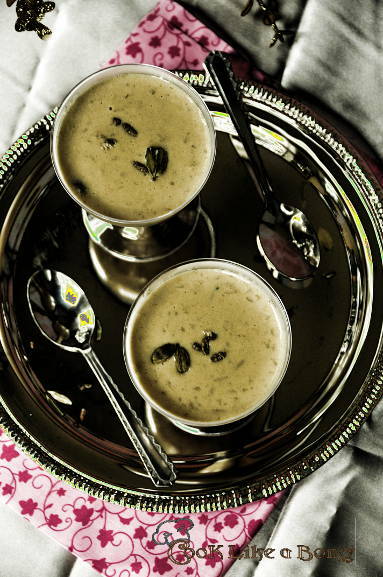 A Bengali occasion without payesh is yet to be heard of. Rice or vermicelli is the two main options for making payesh. The short grained scented gobindobhog chal is ideal for preparing payesh, the scent from the rice adds a special flavor to the whole preparation. The vermicelli or simayer payesh is a quick and easier version. Though sugar is used as the main sweetener, during winter the just-in-market jaggery, nalen gur adds a wintery treat to payesh. Gitadini sent me a 2 quart saucepan to review. The saucepan has built-in strainer and is ideal for making tea, especially for people like e who keep on loosing the tea strainer. The built-in strainer allows you to pour tea into the cups directly without a tea strainer. But, I wanted to use the strainer for something better and preparing payesh in it was the best option I could think of. The handle is sturdy and has an extra padding for better comfort and insulation. While, making payesh you should be extra careful as the rice tends to get stuck to the bottom of the pan, but this saucepan worked wonders. And, the best part is it’s easy to clean and is dishwasher safe. I’m planning to prepare soups in it too and I think it would be great for deep frying. They were also kind enough to send me a wall canvas (picture of ganesh). The canvas is nice and light weight, ideal for gifts or just for you to give your room an Indian touch. Hot Tips – Mixing ghee before adding the rice to milk lets the rice stay separated. Always test the jaggery by mixing it with little milk before adding it to the payesh. At times the jaggery clumps the milk, making the payesh a clumpy mess. The gurer payesh goes to the Chandrani’s Valentines’s Treat. Lovely recipe. This sounds similar to payasam we make in South India. Lovely presentation. 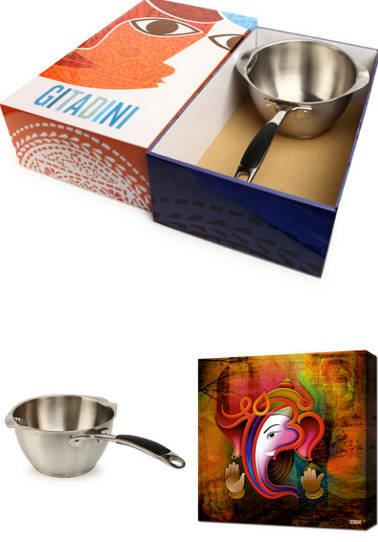 thanks for testing the GitaDini saucepan! What a lovely recipe, it sounds soooo tasty! Fabulous clicks for a delicious “payasam”, (we call it this way) love your blog!!! Gurer payesh naam shunlei jibe jol ese jai. Beautiful presentation and Yummy payesh..